The past two decades have seen a steady growth on two fronts: in the number of students seeking higher education and in the number of institutions (both public and independent) providing it. This is not coincidence, but cause and effect. Following the university expansions of the 1960s and 1990s, which gave us the Universities of York, Kent and Lancaster to name a few, student demand has brought us again to a critical time for higher education. Growing demand in numbers alone has driven the need for more providers, while growing demand for innovative, industry-focused, and vocational courses in particular has directed the expansion of provision towards largely teaching-focused institutions, very different from the research-laden traditional universities. The White Paper is a much-needed response to this recent expansion. While the headlines harp on about ‘new entrants’ and ‘marketisation’, these proposals will do far more to bring consistent and effective regulation to bear on the independent sector – and through it, more confidence and stability for students – than to open the floodgates to a wave of new providers. The truth is that the wave has already broken. The independent sector is thriving, as students turn to courses designed with their needs and interests in mind, not those of a distracted, research-focused, rankings-obsessed faculty. Many want intensive two-year degrees, flexible learning or less costly courses, and to be taught by industry experts instead of leading researchers. What they need, though, and what this White Paper delivers, is consistency and clarity in how these attractive new providers who do not receive public funding are regulated, and their quality assured. The failure to pass HE legislation in 2011 has resulted in piecemeal, reactionary and optional regulation for independent providers, focused more on access to loans than a quality student experience. In the absence of legislation to create a single regulator for HE, multiple arms of government have developed partial solutions to monitoring quality on the fly and off the cuff. These regulators have been facing implementation, evolution and revision issues simultaneously, and leaving individual providers unsure of where they will end up in a regulatory game of musical chairs. 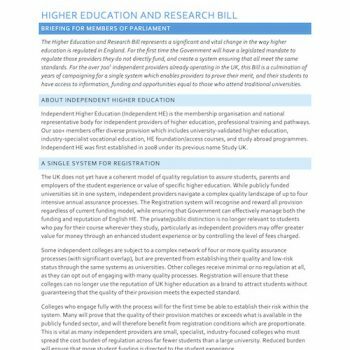 The White Paper marks the first serious attempt to bring coherence to regulation across higher education through its ‘single route’. Providers can clearly understand what is expected of them and either rise to this challenge or safely exit whilst protecting students. Both are extremely difficult at present because of piecemeal and reactionary regulation, which has led to Home Office immigration officers parading around as arbiters of quality. The single route will also offer a series of protections to the sector. Most independent providers make reasonable decisions based on carefully considered risks, with the aim of ensuring that their students receive the best education possible. Widely publicised evidence has shown us, however, that some do not. The White Paper proposals for ‘Approved Provider’ status will ensure that the majority can conclusively demonstrate their quality, while those who fall short will no longer be able to get by on the reputations of the sector. Providers who have invested in quality will receive the financial rewards of this investment. Others will need to step up their game to achieve the same result. Students are already voting with their application forms for independent providers, and their designation for student funding has broadened this eager cohort further. The White Paper will give more of them than ever the chance to study fashion with Vogue, dramatic arts in a working theatre or football business in Wembley stadium, supported financially and through an easy-to-understand system of quality judgements and information. Instead of a ranking system dominated by research, which makes no attempt to understand the student experience, initiatives like the Teaching Excellence Framework could provide the opportunity for applicants to evaluate the learning and teaching they could receive at an institution. Leaving aside detailed debates on the implementation of TEF, it is the first and only platform for comparing teaching across the full range of HE providers. It will no doubt be – like the RAE/REF before it – developed and redeveloped, and its qualitative detail will define its success. But at least it starts somewhere, for reliable information on teaching is sorely needed by students. The UK higher education sector has never been a traditional market, and regulation must never reduce it to a uniform service provided to students of a certain age. Students are not uniform, their futures are not uniform, nor therefore should their higher education be uniform. This White Paper aims to regulate what student choice has already made necessary: industry-led, innovative teaching which responds quickly to student and employer needs. Not only will students today have many jobs over their working life, but many will have one which did not exist when they started their degree. HEIs must move as quickly as the world for which they are preparing their students. The job of the government is not to restrict student choice but to ensure they are fully informed in the choices they make. The predictable decisions by some universities to try to protect their dominant model – and deny students this choice – is regrettable. As long as there is student choice there will be competition, and all that comes with it. This White Paper is simply about setting fair, consistent, and transparent ground rules for that competition.